Today, we announced a partnership with Gosnold on Cape Cod to improve treatment outcomes for people challenged with addiction. Gosnold is integrating EDI throughout its therapeutic programs including with individual patients, small groups, and larger community settings. Patients are oriented and trained on EDI when first entering the Gosnold treatment program. They are then given opportunities to use digital imagery for self-expression throughout the course of their stays. This includes shorter term acute care, longer term residential programs, and ongoing recovery coaching. Gosnold’s model enables EDI to be integrated into the fabric of existing therapeutic programs. EDI itself is not a “therapy.” EDI is a new and innovative way of enhancing existing evidence-based therapeutic approaches. We are excited to be partnering with Gosnold as the first addiction treatment organization to be fully integrating EDI into the care it provides. This image from “Peter”, a patient at Gosnold, is one of our favorite EDI examples. In a therapeutic group, Peter shared how this single image told the whole story of his addiction. 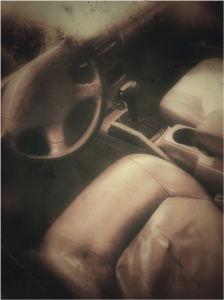 It began as photograph of the front seat of Peter’s car. He explained how when he was using drugs, each day after work he would drive to an isolated location, and spend hours “wasting my life away getting high.” Each evening after he knew his parents would be in bed, he would go home and then repeat the same cycle day after day. Remarkably, Peter said he hadn’t been able to tell this story before. He said he was hurting and was sick of talking about his challenges and that nothing ever changes. But that with this image, he finally could express what had happened. This is what makes EDI so powerful.